Italian Spinones are one of the lesser-known gundog breeds. But have a special place in the hearts of their owners. Kind tempered but very hard working, these beautiful dogs have been brought back from the brink of extinction. They are now found as both working and pet dogs in homes around the UK. As you would expect, the Italian Spinone is thought to originate in Italy. Although there are some claims to the contrary. As one of the oldest recorded gundog breeds, it is impossible to be sure on this point at present. It seems most likely however, that the Spinone is a relative of the German Wirehaired Pointer, and it is certainly similar in appearance. This breed was given the name Spinone in the 19th Century. The Italian Spinone has a dense, coarse coat of medium length. It is white, orange or brown in colour, or a combination of two of these. [wp_ad_camp_1]They are large dogs that are well proportioned and have packs of character. Their faces sport large eye ridges that give the impression of furrowed brows. They have appropriately long and deep muzzles, and eyes well set in their heads without protruding or drooping eyelids. Spinones tails are thick and long if undocked. When docked they should be left at approximate half their intended length. Italian Spinones can make excellent gundogs, having been bred for generations for hunt, point, retrieve work. They are well-built dogs, with strong legs, well proportioned bodies. These thick coats and strong muscles mean that they can work tirelessly through tough undergrowth. Their leathery skin gives extra protection when pushing through bracken and potentially thorny bushes. They are also well known for having exceptional stamina, and will happily run at a fast trot for a prolonged period of time. The Kennel Club describe them as ‘hardy and adaptable to any terrain including water’. They are perhaps best known for working in rough woodland and marshland. The Italian Spinone has a good reputation for being well tempered. He is often described as being gentle, docile and affectionate to his human companions. In general they should not have guarding issues or anxiety around strangers, if well socialised as puppies. As far as their temperament goes, they can make very lovely family pets. The risks to small children are more likely to come from their large stature and very long wagging tail, than from inherent aggression. If you are considering an Italian Spinone as a family pet as well as a working dog, you will need to carefully plan their living arrangements. Big dogs take up a lot of space, and potentially will require crating at certain points during the day until they are a couple of years old. The Italian Spinone isn’t the lowest maintenance breed to have around the house. Italian Spinones have gorgeous coats. Although they are not troublesome to look after, they do need regular attention to stay tangle and muck free. It is important to get a Spinone used to be groomed from an early age, and to associate it for them with positive and rewarding experiences. You will need to groom him at least a couple of times a week to keep him in a nice condition. Spinones also have a lot of hair on their faces. This will inevitably get full of food or water after mealtimes. Unfortunately, the Italian Spinone does suffer from some nasty diseases. Probably as a result of the inbreeding it has undergone when it’s numbers were very low. Like a lot of other gundog breeds, Spinones can suffer from hip dysplasia. Where the hip joint develops improperly. If you are buying a puppy, make sure both parents have at least average hip scores for the breed. 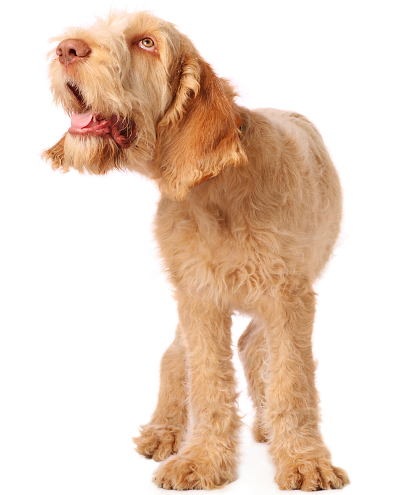 A more serious issue that you must be aware of when purchasing a Spinone puppy is Cerebellar Ataxia (CA). This is a serious neurological disease, which effects motor movements in affected dogs. Affected puppies will not show signs of CA immediately, but their gait will become unsteady in the first few months of life and progressively get worse from there. Sadly, affected dogs are usually euthanized before they even reach their first birthday. Thankfully, there is now a DNA test for CA. You must only buy a puppy who has either both parents CA clear, or one Clear and one Carrier. If you buy a pup who has one parent as a carrier, they should not suffer from the disease themselves. You will however have to have a DNA test carried out on your pup should you wish to breed from him in the future, and if he is a carrier too, he will have to be mated to a Clear Spinone. Whenever you purchase a puppy it is important to arm yourself with research first, to make sure he has the best chance of being healthy. This is especially important in rare breeds where the breeding population may be very small. The Spinone is a lovely pet for those who are happy to spend some time on regular grooming. They make an unusual shooting companion for those interested in HPR work and looking for something a bit different. It is important to pick your puppy’s parent’s carefully to give him the best chance of a healthy future. If you have a lively household, and want a hard hunting, working dog, who will be a loyal companion and gentle friend at home, then the Italian Spinone could be just what you are looking for. but sensitive pet – we love him to bits!